Bucklars Hard | Flickr - Photo Sharing! Buckler's Hard, originally called Montagu Town, was built by the second Duke of Montagu, and was intended to be a free port for trade with the West Indies. Its geography also favoured the development of shipbuilding, as the hamlet possessed access to a sheltered but navigable waterway with gravel banks capable of supporting slipways for vessel construction and launch. Timber for hulls was also readily available from the surrounding New Forest. 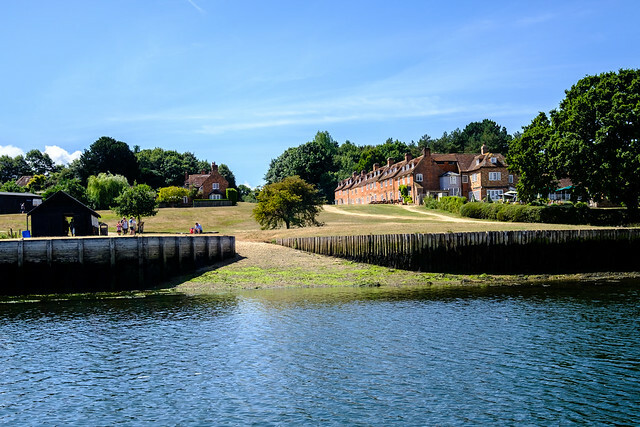 Shipbuilding at Buckler's Hard commenced in the early eighteenth century. A private shipyard adjoining the hamlet was established by James Wyatt, a local entrepreneur and timber merchant from Hythe on Southampton Water, . Wyatt and Co won a contract to build a Navy ship, HMS Surprise in 1744 and subsequently another, HMS Scorpion, at Buckler's Hard. Henry Adams, a Master Shipwright, was sent from Deptford Dockyard to Buckler's Hard in 1744 by the Admiralty to oversee the building of these ships by Wyatt & Co. After the completion of the initial ships by Wyatt, Buckler's Hard grew to national prominence under Henry Adams and won subsequent Royal Navy contracts. Over the following sixty years he would supervise the building of 43 Royal Navy ships at Buckler's Hard, including HMS Euryalus, HMS Swiftsure and HMS Agamemnon, all of which fought at the Battle of Trafalgar in 1805. A Great Capture, CJD imagery, and 10 other people added this photo to their favorites. Nice postcard from South of England! !